Springtime in Texas is beautiful. The bluebonnets bloom, the grass is green and the weather warms. Spring also brings the threat of severe weather. Students and members of the community filled the Fain auditorium at Tarleton for the 2015 Skywarn storm training on March 26. Eric Martello, a senior meteorologist from the National Weather Service in Fort Worth, gave the lecture. Martello has been with the National Weather Service for 14 years. 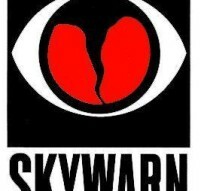 A Skywarn spotter is a trained individual or team that is able to provide the national weather service with up-to-date weather warnings. First, Martello gave the ingredients for a storm, which are moisture, lift and instability. “Wind shear is a change in wind speed or direction, which can give storms spin,” said Martello. There are three types of thunderstorms, and Martello stressed that it is important to know the differences. Ordinary cell thunderstorms create a localized threat, multicell clusters pose a moderate threat, and supercell thunderstorms are the storms that rotate and cause the most damage and destruction; those are the ones that often kill people. Trained storm spotters help the National Weather Service decide whether or not to put out a storm warning. “Sometimes we think we need to put out a warning, then we will get a call from a storm spotter in the field who will say ‘Yeah, it’s not that bad.’ That is why a spotter is important,” said Martello. There are trained storm spotters all over the state, and several are located right here in Erath County. Martello said that HAM radio is still the best way to report severe weather to the National Weather Service. You can join a local HAM group and get an amateur license. By definition, a severe thunderstorm is a thunderstorm that produces winds in excess of 58 M.P.H. and/or hail that is one inch in diameter. A tornado is a violently rotating column of air in contact with the ground and extending from the base of a thunderstorm, most commonly a supercell. This is why a supercell storm increases a chance for severe weather. If out driving in your car when severe weather strikes, staying in your car is a bad idea. Strong winds can flip a vehicle, and a vehicle can float in just two inches of water. It is best to take shelter in a solid building away from windows. If there is threat of a tornado, take shelter in the innermost room of your house. “It’s important to know your escape route if you need to move,” said Martello. If you want to learn more about how to spot storms, go to www.weather.gov.